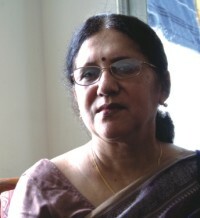 Purabi Basu has been a prolific writer for over 30 years now, a scientist by profession and creative writer by choice. Writing in Bangla she has been one of the foremost exponents of the short story and her themes of choice are anything but ordinary. Dealing with almost every topic under the sun, her writing could not be more different from her profession; she uses the limited canvas of the short story to create infinite possibilities. She has been anthologised on numerous occasions and her writing has been critically acclaimed, in fact she also received the prestigious Annanya Literary Award in late 2005. A major part of her literary career was spent abroad, where through her profession questions of science did not speak louder than her heart, a heart that expressed itself though fiction. It is apt that the Coldplay song The Scientist ends with the line, 'lets go back to the start' because that is exactly what she has done, from a village in rural Bangladesh to living and writing in New York the themes in her work all revolve around Bangladesh and its people. To put it simply she came back to her start. Many people have been quick to note that in your short stories you deal with feminist issues, yet you have also said you are uncomfortable with the term feminist. How would you characterise your work then? I do write on women's condition, their place in our society and their rights. However, I write on many other issues as well. It's not that I am uncomfortable with the term 'feminist.' However, I am not sure whether I should be quite categorised as a feminist writer. I also do not like to be cornered or labeled just as a feminist writer as every human rights violation inspires me to write; not only women's issues. Your latest book (Radha Will Not Cook Today and Other Stories) is a collection of short stories translated into English. How important was it for you to finally put together a collection in English? It's very important for me to publish my stories in English for the wider audience. Prof. Niaz Zaman was instrumental for the publication of this book. Without her involvement and encouragement this would not have been possible. I believe short stories that depict everyday life of people with their universal instincts and feelings should not be confined only to a particular language. Although I write on mainly Bangladesh and its people, I believe my stories have universal appeal and people of other languages might derive pleasure reading them. Also, considering the fact that many in the modern generation of Bengalis prefer to read in English, I believe I may be able to cross-generational boundaries as well. From a government girls' high school in Munshiganj to a PhD and holding down a full time job in America you have come a long way from your roots, how has this journey influenced your writing? My exposure to various cultures and ethnic groups, owing to the fact that I stayed, studied/and worked abroad, has definitely widened my outlook. I also came to realise how people of different races and nationalities have similar experiences and outlooks on the world, and I have thus been able to gain an understanding of the human experience as a whole. A pharmacologist by profession, how and where did creative writing enter your life? My creative writing started long before I became a research scientist. I always felt I had a familiarity with it. Frankly speaking, I feel more happy and proud when I publish a short story than when I publish a research paper in a scientific journal. I feel my creative writing is totally my own it's completely original. On the other hand, my scientific writing is mainly a collective work and does not require the same level of individual creativity. In my creative writing I am able to surpass constraints on expression, something I cannot do in my scientific profession. Your husband Jyoti Prakash Dutta is also a widely read highly published author, what influence if any does he have on your writing and vice versa? We both write short stories and usually read each other's stories before they are published. However, our style of writing and the contents are quite different and I don't think we influenced each other much in that regard. Jyoti selected a number of titles of my stories. Most of your stories are based on people and their lives in Bangladesh, a theme which is not very common for an expatriate writer. What do you attribute this to? Although I spent more than half of my life abroad, I feel more connected to Bangladesh. I have written very few pieces on American life. I can't explain it, but I am more comfortable writing about Bangladesh and Bengalis. It is an inner kinship with my country that will never go away, no matter where I am physically present. At one point in time you counted Taslima Nasreen as one of your closest friends, did her presence ever directly or indirectly influence your writing, if so, then how? What do you have to say about her plight now? Taslima is a good friend of mine. I admire her prose and many poems. I also admire her courage in writing about very controversial topics. I however don't believe, she has influenced my writing or my writing style. I feel her desire to return home should be honoured. You have said that discrimination is one of the driving forces behind your work, how and why? Where does the rest of your inspiration come from? I have observed people being discriminated against for various reasons, and I felt like writing in each instance. The rest of my inspiration comes from other life experiences, such as my childhood, with my friends and so many other things. You have also said that you would be happy to turn any of your stories into a movie, with a new wave of directors in Bangladesh tackling a wide variety of topics do you see that happening in the near future? I will be happy if a talented director decides to make a movie out of my stories. However I have not given it much thought. I would certainly want to be able to have a hand in whatever translation to another medium it may take. You have said that you wrote a novel that as of yet remains unpublished, do you ever plan to publish it or even write a new one? At this juncture I feel I do not want to publish the novel I wrote a long time ago, when I was a student. However I may write a new one in the future. And finally do you see yourself ever writing in English, or will Bangla remain your literary language of choice? My professional writings are in English but I do literary work in Bangla. I feel more natural and more comfortable with my creative writings in Bangla. As of today I do not plan to write in English, but I might change my mind in the future.